You will find them inside office buildings, libraries and train stations; the tile vaults, domes and arches which act as skeletons holding up massive American landmarks. It was a Spanish immigrant father and his son who built these feats of engineering in world landmarks such as Ellis Island, New York's Grand Central Station and five U.S. state capitol buildings. Yet this immigrant family's place in history was largely forgotten, until now. The works of Rafael Guastavino and his son Rafael, Jr. are the subject of an exhibit at the Museum of the City of New York. The father-son team built over 1,000 projects nationwide; the museum focuses on 250 commissioned works built by the family. “This is a great American story,” said John Ochsendorf, a civil engineering professor at MIT and the exhibit's director. The works showcase the essential skills immigrants like the Guastavinos have brought to the country, he explained in an interview. “No one could predict when [Guastavino] arrived to New York in 1881 that by the time of his death 27 years later he would be responsible for all of these incredible buildings,” Ochsendorf said. It is also a reminder that buildings and parks contain the living culture and history of our towns and cities. Rafael Guastavino arrived at a time when New York was booming with factories and businesses. Years later, his son Rafael Jr. would build the long-arched ceilings of the Registry Room at Ellis Island, which welcomed millions of immigrants to America. The golden age of manufacturing created many opportunities for the Guastavino family. Today, tourists from around the world can see the father and son's vaulted ceilings at New York City landmarks such as the Oyster Bar in Grand Central Terminal, the Bronx Zoo, Prospect Park in Brooklyn, Carnegie Hall and the Cathedral of Saint John the Divine in upper Manhattan. While the Spanish immigrant family is being recognized centuries later for their mastery of complex and beautiful structures, the reality is that like many immigrants, they had to use their skills to overcome setbacks and adversity. Guastavino’s first architecture project in 1886 did not include any vaulting. The row of six buildings on West 78th Street stood out against New York’s sober brownstone architecture with exotic horseshoe-shaped arches and brick and stone facades. But Guastavino’s Spanish-Islamic style was not compelling enough to win larger architecture competitions. The Spanish builder’s luck would change almost 10 years later, after architect Charles Follen McKim used Guastavino’s thin tile vaulting system in the Boston Public Library. Declared a “Palace for the People”, the McKim building is a monument of the City Beautifying Movement, which aimed to build grand public spaces that championed American values and democracy. Guastavino’s fire-resistant tile vaulting system became popular with top American architects who wanted to build long-lasting buildings. McKim collaborated with Guastavino to expose the tile and brick of the Boston Public Library’s ceilings, evoking the classic arches and domes of ancient Rome. But for American architects, the Guastavino vaulting system was something new, an engineering marvel that could be built quickly and cheaply with layers of interlocking tiles and mortar. The system was particularly appealing because the v-shaped tile patterns were also fireproof and durable. For nineteenth century New Yorkers who could still remember the 1856 fire of the Latting Observatory in Manhattan—a 315 ft. iron-braced wooden tower that was once America’s tallest skyscraper —fireproofing buildings was a genuine concern. 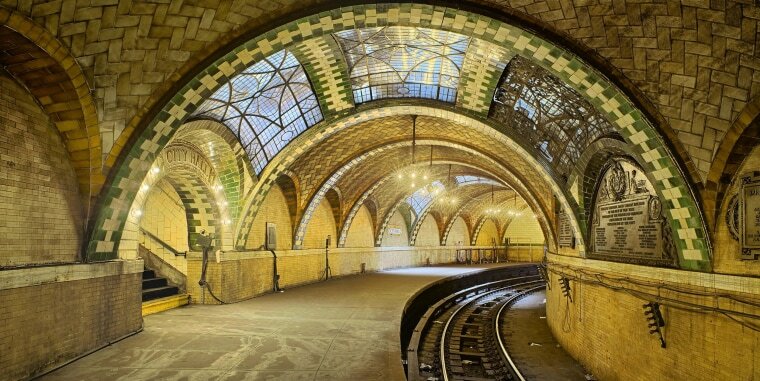 And suddenly, after the success of the Boston Public Library, Guastavino’s fire-resistant tile vaulting system became popular with top American architects who wanted to build long-lasting buildings. The Spanish builder ultimately established a fireproofing construction company with his son. During the 20th century, the Guastavino company grew nationwide, working on important landmarks like the Lincoln Park Zoo in Chicago, the National Museum of Natural History in Washington, D.C., the City Hall Subway Station in New York, and other public spaces that shape the character of American cities. “Many of us will find personal connections with architecture,” Ochsendorf said. The MIT professor hopes that by rediscovering Guastavino projects, Americans will understand that locked inside the design of a building is the DNA of our culture and history, including our immigrants. The Guastavino exhibit at the Museum of the City of New York is open until September 7.